Hotel Boutique Legado Mitico was once the mansion of a Salta patrician, and is located deep in Salta’s historic district. The hotel is steeped in legend, history, and myth, with each room named after heroes from Salta’s past. The guestroom La Escritora, for example, is a tribute to Juana Manuela Gorriti, a fiery 19th century Argentine author. The rooms includes a small patio, wood-burning stove, and hydro-massage tub, as well as a flat screen TV, mini-bar, safe-deposit box, air-conditioning and heater, internet, and telephone. There is also a library, solarium, gift shop, gorgeous patio, and breakfast lounge. This hotel is socially committed to many projects, including RELAF, a child protection agency. The Hotel Sheraton Salta, conveniently located just 10 blocks from downtown Salta in the Monumento neighborhood, boasts stunning views of the Lerma Valley and the Andes just beyond. Its 145 luxurious rooms feature panoramic views, comfortable beds draped in soft duvets, high-speed internet, cable TVs, mini-bars, and safe-deposit boxes. Enjoy international cuisine and fine dining in the Restaurant Terracotta, or breakfast buffet in the Restaurante 330 Coffee Shop. The lobby bar offers a spectacular panoramic view of the city, and the hotel also has its own 24 hour gym, a heated outdoor pool, a Jacuzzi, and a massage parlor. The designer hotel chain, Hotel Design Suites, has built artsy hotels throughout Argentina successfully combining urban chic and rural charm. The brainchild of the famous Uruguayan architect Carlos Ott, the cutting edge Design Suite Salta is well-situated in Salta’s historic center, just off Belgrano square. The modern architecture is embellished with gaucho-themed chairs, wood paneling, and fern-adorned patios. Relax under white bed linens, while watching a movie on the DVD-equipped satellite TV. The rooms also feature mini-bars and Jacuzzi tubs. Other amenities include an art gallery, a health club with sauna and gym, and indoor and outdoor pool, and a Resto bar and wine bar. The magnificent Hotel Alejandro I towers above the city just 2 blocks from Plaza Belgrano. Here, attention to detail is excellent in the 160 rooms and gorgeous suites which boast splendid views of Salta’s historic district, and all include sleek décor, cable TV, safe-deposit boxes, air conditioning, internet, mini-bar, and telephone. The elegant El Rincon de Alejandro restaurant serves excellent international cuisine, as well as national and international wines. The El Meson de la Plaza restaurant serves buffet breakfast, lunch and dinner, with plenty of a la carte choices. There is also the Hidalgo Piano Bar, where guests can down a cocktail or sip champagne, nibble appetizers or sandwiches, all the while enjoying entertaining live music. The marvelous Hotel Patios de Lerma, located near Parque 20 de Febrero, only a few blocks away from Salta’s historic district, is a stylish option for your Salta hotel. The décor is sophisticated, with sleek black paneling, natural wood furnishings, and gorgeous lighting. Each of the 31 rooms comes with a satellite flat screen TV, mini-bar, and safe-deposit box. Exquisite regional and international cuisine is served in the restaurant, and guests can also indulge in fine coffee and sweets in the cafeteria. Breakfast is served American buffet-style, with a great selection of breads and sweets, juices, and cereals. Other services include a spa, laundry, and an outdoor terrace with Jacuzzi. Full of character, the Hotel Solar de la Plaza was once the home of a Salta patrician family, Patron Costas, during the latter half of the 20th century. The Spanish colonial style is evident in the tile roof, large windows, and flower-filled patio and solarium. Four rooms were the actual bedrooms of the Patron Costas, now renovated with hardwood floors, Jacuzzi tubs, and wrought iron floor lamps. The rooms in the new wing boast marble pedestal sinks, and all rooms have internet, satellite TV, safe-deposit boxes, and air conditioning and heating. The common areas are elegant – including the rooftop pool and sun deck, as well as La Terraza restaurant, which offers views of the beautiful courtyard garden. Dry cleaning and laundry services, lounges, a bar, and business center make this luxurious mansion a complete modern hotel. The Hotel Almeria is located just a few blocks from the main square in Salta. Designed in authentic Andalucian colonial style, this hotel is decked out in Spanish tile work, some painted with famous Spanish poems. The service is excellent and rooms are very spacious, and fully equipped with cable TV, telephone, air conditioning, heating, and safe-deposit box. The best rooms boast views of the San Bernardo hill, and some are equipped for persons with disabilities. All guests have access to the buffet breakfast, spa, which includes a Scottish shower and Jacuzzi, and business center. The on-site Darrical Restaurant offers some delicious gourmet selections of regional and fusion cuisine and the Cherin Tea Bar serves various drinks and snacks. This gem of a hotel, Parador El Lagar, is located only 3 blocks from the most active nightlife in Salta. The hotel itself is beautiful and quiet, offering spacious, comfortable rooms and superb service. Under the Spanish tile roof, the courtyard and grounds of the hotel give off the scent of fresh flowers. A stay includes breakfast, TV, telephone, air conditioning and heating, and access to the relaxing outdoor pool. Located 12 blocks from downtown, the Papyrus Boutique hotel is a stylish hotel with excellent views overlooking the Spanish tile rooftops of the city. Each of the nine rooms is named after a flower whose character is tastefully reflected in its colors and decorations. The rooms come with mini-bars, TVs, telephone, air conditioning and heating, and available services include safe-deposit boxes, laundry, and internet. The talented chef creates a new menu each night in the restaurant, showcasing regional flavors and dishes with an international flair. Located in Salta’s historic center, only three blocks from 9 de Julio center, Hotel Ayres de Salta is the perfect resting place for your Argentina vacation. The décor is modern and inviting, with an attentive and helpful bilingual staff to cater to all your needs. The hotel’s 40 rooms are warm, cozy, and beautifully decorated with wood and floral accents. Each room comes with cable TV, internet, telephone, mini-bar, safe-deposit box, and air conditioning and heating. The restaurant serves buffet breakfast, as well as distinctive dishes throughout the day. The stylish bar is perfect for enjoying a glass of fine wine. The swimming pool, Jacuzzi, and gym are perched on the rooftop terrace with a fantastic view of Salta and the Lerma Valley. Other great amenities include computers with internet, 24 hour room service, laundry and dry cleaning, babysitting, and luggage storage. Located right next to the Plaza Tribunales in downtown Salta, the colonial-style Hotel del Virrey takes guests a step back in time. Heavy wooden doors carved into colonial archways give way to spacious rooms decorated with smooth red tile, chandeliers, and heavy curtains. Nonetheless, each room is wonderfully appointed with modern amenities including a mini-bar, safe-deposit box, high speed internet access, telephone, and cable TV. Additionally, the hotel offers dry cleaning services, an outdoor swimming pool, and a gym. The restaurant serves authentic Argentine barbecue, and there is also a café and lounge. The gorgeous neoclassical Hotel Salta, built in 1890, is ideally located, facing Plaza 9 de Julio and boasts a striking façade that splendidly lights up at night. There are 99 recently renovated and comfortable rooms, all offering comfortable accommodations, mini-bars, cable TV, telephones, air conditioning and heating, internet, and safe-deposit boxes. The suites have elegant wood-carved furnishings, tubs with hydro-massage, and incredible vistas of the city. The courtyard heated pool is open all day and includes a grill, solarium, and views of the downtown buildings. There is also a spa, gym, restaurant with buffet breakfast, and occasional live music shows. Room service, business center, laundry and dry cleaning, and safe-deposit boxes complete this excellent hotel to make your stay in Salta as comfortable as it can be. A popular honeymoon spot, the comfortable Hotel Altos de Balcarce, is located on Balcarce Street, in the heart of downtown Salta. The 48 rooms are decorated with vibrant Andean patterns, and include air conditioning, internet, cable TV, safe-deposit boxes, and telephones. There is also a room fully-equipped for people with disabilities. The restaurant offers delicious Argentine fare, and there is also a bar where to taste exquisite local cocktails. The outdoor swimming pool is situated in an absolutely marvelous courtyard. Computers with internet, laundry, dry cleaning, and babysitting services are also available. The Portezuelo Hotel is located at the foot of San Bernardo hill, within easy walking distance of San Martin Park. Surrounding the hotel are lovely gardens from where guests can enjoy a panoramic view of the neighboring countryside. The accommodations are decorated in a simple yet tasteful style and equipped with all modern amenities for guests’ comfort. The hotel also offers an outdoor swimming pool, internet, dry cleaning and laundry services, and lounges. The on-site restaurant serves delicious regional and international cuisine. A colorful hotel, Hotel Casa Real, is strategically located near Salta’s main attractions. The 83 sophisticated rooms are spacious and comfortable, and offer great views of the mountains. The suites come with Jacuzzi tubs and a sitting area, and all rooms feature large beds, central air conditioning and heating, telephone, cable TVs, internet, mini-bars, and safe-deposit boxes. Take advantage of the well-appointed spa which offers numerous activities each day. The richly decorated Los Cebiles restaurant is very cozy, and serves buffet breakfast as well as international cuisine during the day. There is also a pleasant coffee shop, where cheese and wine are served on a lovely outdoor patio. Other services include baby-sitter, room service, and transfers to the nearby casino and golf club. 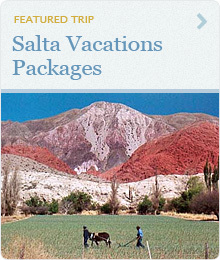 Posada del Sol is located in the heart of Salta within walking distance of the town’s main attractions. Service is excellent, and the 55 brightly colored rooms are modern and comfortable. Rooms come with buffet breakfast, internet, cable TV, safe-deposit boxes, air conditioning and heating, telephone, mini-bar, and laundry service. Apartment-sized rooms, perfect for families, are also available. The restaurant, Bavaro, serves regional favorites such as empanadas, humitas, locro, tamales as well as a delicious buffet breakfast. There is an adjoining tea room that is perfect for relaxing with a hot drink and dessert after a long day exploring the city. A delightful country house, Hotel Boutique House of Jasmines, is surrounded by the beauty and nature of the Andean foothills and is a perfect place to unwind for a few days on your Salta vacation. The surrounding grounds, including the garden and the nearby park, are dotted with fragrant jasmine plants. The luxurious rooms are spacious, with exquisite cream and earthen colored linens alongside traditionally designed furniture. The restaurant serves delicious and generous traditional home cooking. This luxury boutique hotel is surrounded by unbelievable natural beauty. You could spend a week unwinding at Estancia Colomé and not exhaust the myriad walks and trails to ride. Winemaker and art collector, Donald Hess, found the perfect spot in an Andean valley to start his vineyard and hotel near Salta. All 9 suites feature radiant floor heating, a fireplace, mini bar, telephone, safe deposit box, and 4 music channels. The living room, library, dining room, massage and terrace are all excellent places to relax, after biking, hiking, and horseback riding throughout the large estancia. The whole estate is self-sufficient for energy as an ingenious hydro-electric system powers both the hotel and the winery with electricity while the sheep and cattle produce organic meat and milk and manure to feed the vines and organic kitchen garden.